Thank you for your selection of children’s television shows right now. Thank you for an alternative to Peppa Pig. Thank you for Alphabloks, which has excited my 3 year old about learning phonics, spelling and alphabet now that she is old enough. Thank you for the quirky, feel-good-ness of Abney and Teal, Sarah and Duck, Postman Pat. Thank you for Tree Fu Tom and leaping about the living room in our ‘spell pose’ (both of us!). Thank you for Mr Bloom, Nina and Mr Maker for making learning fun and inspiring. But, mostly right now, thank you for Katie and I Can Cook! Let me tell you why. I love cooking with my daughter. I’ve done it since she was able to sit up on the kitchen floor. We have made chocolate crispies, biscuits, puddings, prepared vegetables, mixed bowls and licked spoons. Recently, though, cooking with my 3 year old has mostly involved a large quantity of ingredients (flour, sugar, eggs, carrots, potatoes…) usually with some water being dumped into a bowl and all over the floor, followed by a loss of interest in the proceedings and me left trying to rescue whatever it was ‘we’ were cooking, followed by cleaning up the mess (which daughter does not want to help with). The mess now is arguably worse than it was when she was 18 months, because now she is stronger and bigger and can get to things in the five seconds my back is turned. However, we have recently started watching I Can Cook. I don’t know why, I guess it just started falling in the time before lunch when she watches a little TV, usually while I’m making sandwiches. Suddenly, M is asking “can we make that, Mummy?”. And so we do. We wash hands, make our food, clean up and enjoy eating it, too! Because that’s what Katie does. We have discovered a wealth of recipes that are fun, quick (I’ve learned how important that is!) and tasty. Usually I have all the ingredients already in my cupboard. And, most importantly, when Daddy gets home M shouts excitedly “We made this, Daddy!”. She is so very proud of her achievements! So thank you, CBeebies, for restoring my faith in cooking with children, and for reigniting that spark of excitement and creativity in us all. 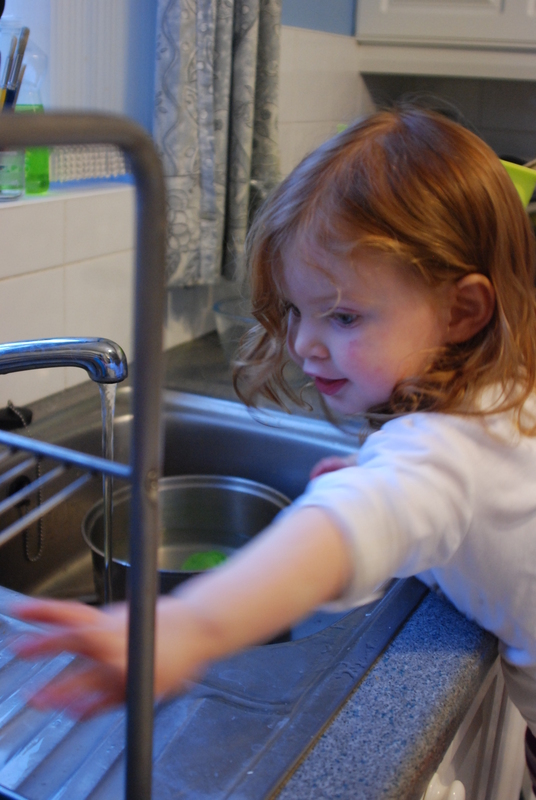 Washing up is also fun! 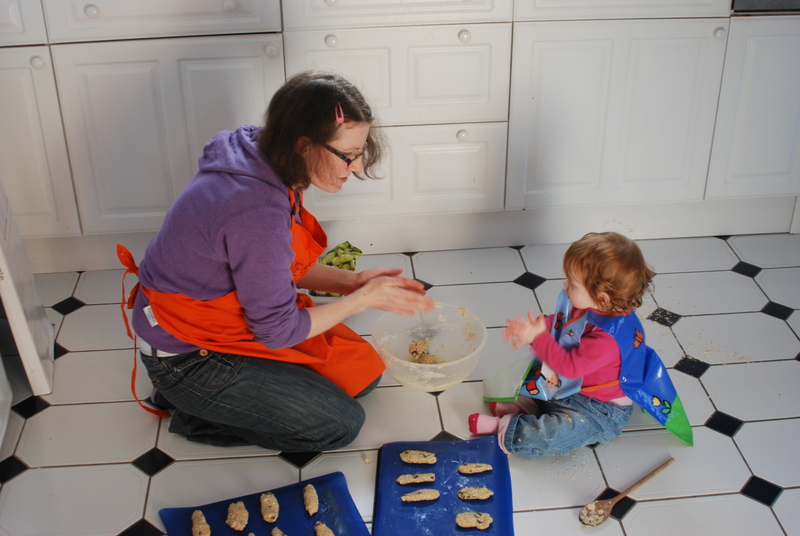 When M had chicken pox at 24 months she wanted to wear her party dress, chef hat, and do some baking. 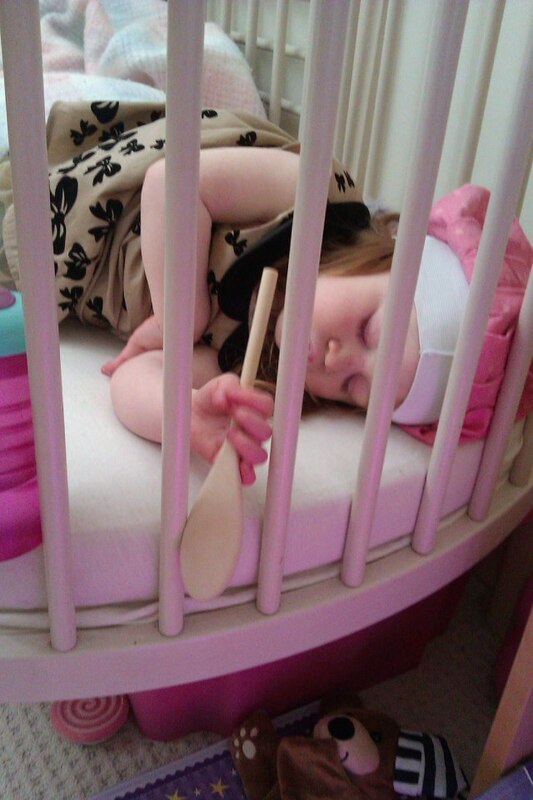 She then fell asleep mid-process. This entry was posted in Uncategorized and tagged baking, toddlers. Bookmark the permalink.